There is an abundance of talent on the second of the five 2016 Pangos Frosh/Soph Camps stops throughout the country, and there figured to be with nearly 220 kids in attendance at the All-South edition. With such a large group, naturally there are plenty of talented athletes, especially among wing players. There aren’t as many standout lead guards, but the ones who have played well so far are among the top players in camp after one day. Texans Avery Anderson and Jahari Long were among the day one lead guards that hit the open man and played unselfishly. 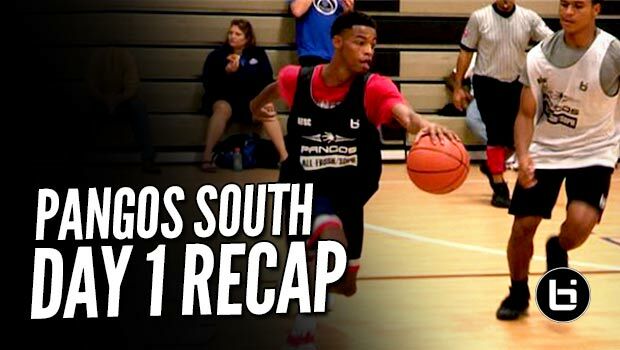 RELATED: Major HEAT at Pangos All-South Frosh/Soph Camp! Dallas — With over 215 campers at the Triple A/Focused Learning Academy looking to showcase their skills at the Pangos All-South Frosh/Soph Camp, it hasn’t been easy to standout from the pack for a vast majority of the campers. There are just so many young players with a similar skill level — and similar size. The strength of campers are the wing-types in attendance who are able to finish in the open court and are physically the most advanced group of players. Most of those players are between 6-foot-3 and 6-foot-7 and with the wide-open, up-and-down nature of the camp, they are able to finish around the rim with explosive moves. They are generally too big for the guards to handle and are able to beat the big men down the court to score in abundance. Some of the standouts that fall into this category include 6-foot-5 2020 prospect Cade Cunningham (Bowie, Arlington, Texas), the younger brother of former SMU big man Cannen Cunningham, 6-foot-3 2019 prospect Tyrese Maxey (Garland, Texas), one of camp’s most efficient players so far, 6-foot-5 2019 prospect Trey Williams (The Colony, Texas), 6-foot-6 Jalen Wilson (Guyer, Denton, Texas) and 6-foot-6 Jerry Lliya (Redemption Christian, Troy, N.Y.). Cunningham is a straight line player who takes it to the front of the rim with authority. He knows how to change direction with little wasted motion and beats defenders in the easiest manner possible on a consistent basis. Expect him to be in the Cream of the Crop Top 20 All-Star game, as he’s impressed the large contingent of scouts in attendance. Maxey is a relentless scorer with a high IQ on both ends of the court. He can finish on all three levels, covers ground with his dribble penetration and works on the defensive end, too. Maxey is a jack-of-all-trades type; even though he may not appear to overly excel in any one aspect of the game, there is no aspect of the game he is weak at. Lliya, a native of Nigeria with family in the Lone Star State, is one of the top out-of-state standouts among the campers. There are 12 states represented along with the District of Columbia at the event, and Lliya is easy to point out with his length, athleticism and motor. He was putting in work defensively, including a couple of impressive run down blocks. While the wings excelled as a group on day one, it has been a mixed bag for the lead guards so far. There are a large number of small guards (under 5-foot-11) and unfortunately some of these young players don’t quite understand they must be even more outstanding in their performance and approach to the game than bigger players who more often than not receive the benefit of the doubt when it comes to earning scholarships from college coaches. Too often one day one the point guards missed open players on the wings, didn’t quickly advance the ball up court with a well-timed pass or dribbled with their head down while teammates stood around. All was not lost in the backcourt, however, as Avery Anderson and Jahari Long were two that stood out among the bigger guards on the first day. Anderson, a 6-foot-3 2019 prospect out of Northwest (Justin, Texas), displayed outstanding ability to break down defenders, draw the defense and hit the open man. Anderson did this in spectacular fashion in the open court and was also effective in the half court with knifing passes. The lefty has some flash to his game and plenty of confidence, while Long also was deft at hitting the open man. Both are excellent ball-handers who don’t overly worry about primary defenders because they are concentrating on where the help is coming from after they break down or blow by. Long is particularly effective in slicing past defenders and finishing around the rim from a variety of angles. Among the diminutive guards, 5-foot-6 2019 prospect Bryce Cook (South Grand Prairie, Grand Prairie, Texas) turned heads with his ball-handling wizardry, confidence and scoring ability. He took no prisoners on day one and put together a couple of memorable scoring outings that impressed his peers and the new age media members. Traditional media members and scouts would like to see him tone down the flashy play a bit, but his production and ability is undeniable for a small guard. Among the bigs, it was no surprise to see Charles Bassey (St. Anthony, San Antonio, Texas) at the top of the list of performers. The 6-foot-10 center was last year’s top player at this camp, last season’s National Freshman of the Year and has done nothing so far that would take away from his status as arguably the top prospect in the national 2019 class. He’s not the consensus top prospect in the class among the most respected national scouting services, but it’s hard to deny his potential as a franchise-type big man down the line.